Things have been very busy for me lately between work and school and my writing projects. Normally, when this happens, I pick fluffier things for my leisure reading to help me escape for a while each day. 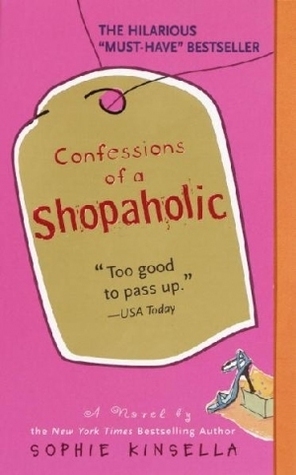 One book that I picked up a few years ago during a similar time of life is one that has stuck with me: Confessions of a Shopaholic by Sophie Kinsella. This is a fun, feel-good romp through the world of journalism and credit card debt. Becky Bloomwood is a funny protagonist who makes lots of mistakes but feels constantly endearing. As she pursues her dreams and has to try to learn how to take care of herself, she finds happiness in unexpected places. This book inspired a movie by the same title, but it is actually VERY different from the movie. I love them both in very different ways. The movie is actually a bit more lighthearted than the book, but I so enjoyed the tone of the book and the additional character development. Currently, there are 8 books in this series, and I really enjoyed the first 3. The later books in the series were less engaging, but I couldn’t help but continue to read them to see what would happen to Becky Bloomwood. So, if you’re looking for a fun escape, I highly recommend giving Confessions of a Shopaholic a try.